These Wooden Nickels from AnyPromo are wooden coins for use as tokens or souvenirs. Originally used as emergency currency during the Civil War and Great Depression, wooden nickels are used today all across America as promotional memorabilia as well as tokens for discounts and free drinks. Are you looking for something more interesting than a paper coupon? Wooden nickels work great as tokens for discounts because they add novelty to the experience. When your customers get a wooden nickel to exchange for something, they'll be eager to turn it in because it is reminiscent of turning in tickets for an arcade prize. Speaking of prizes, wooden nickels make great activity tokens for festivals and camping events. Add another level of fun to your next jamboree by giving out customized wooden nickels as rewards for events! 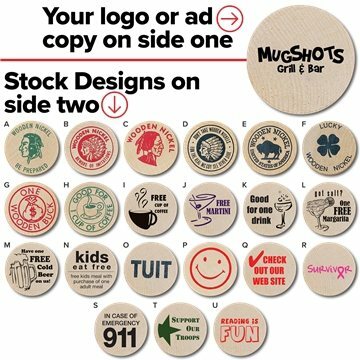 Use your logo or ad copy on side one of wooden nickel. Want a professional design? 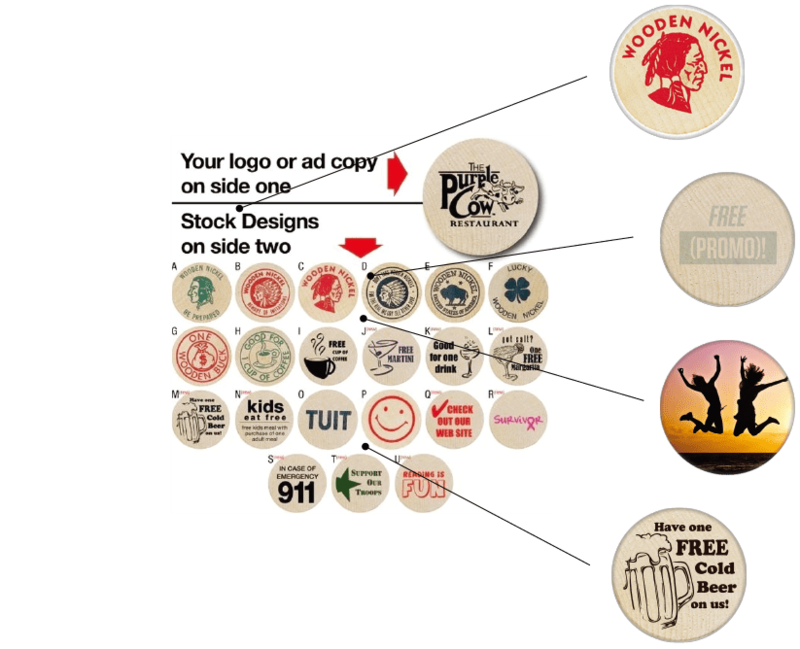 Our Wooden Nickels have 21 stock designs available for print on one or both sides. Wooden Nickels are great for handing out as free drink or prize tokens at your establishment. If you're running a bar trivia or summer camp event, handing out Wooden Nickels is a great way to award and keep track of points. AnyPromo will cover your setup costs when you order these Wooden Nickels with a stock design on one or both sides. We are very pleased with the nickels. You have matched the font we wanted that is exclusive for us. Thank you! The wooden nickles were perfect.The art work was on spot and the product was printed and shipped on time. Everything went perfect, the finished product was very nice and ti was completed in a timely manner.